2019 General Elections: NWTF Organizes Post-Elections Press Parley for Women Candidates .:NWTF:. 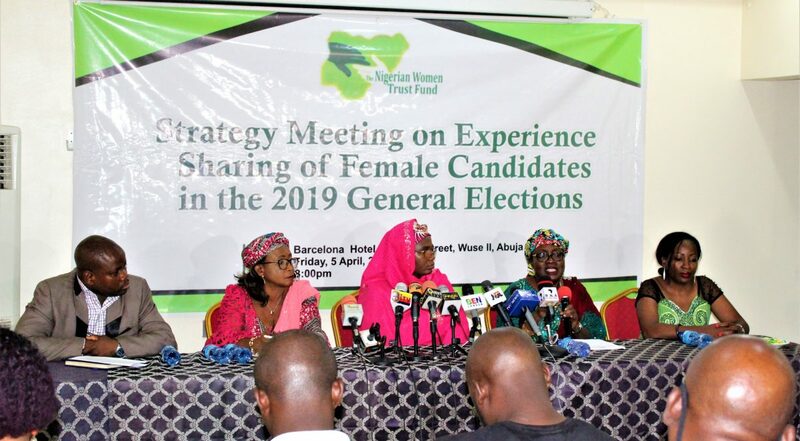 As part of efforts to sustain advocacy for women’s political participation in Nigeria and the importance of an inclusive governance process, the Nigerian Women Trust Fund (NWTF) organized an experience sharing platform for women who contested in the 2019 General Elections with Media personnel on Friday 9th April 2019 at the Barcelona Hotels – Abuja. The event themed: “Strategy Meeting on Experience Sharing of Female Candidates in the 2019 General Elections” was aimed at collectively pulling together the voices of women towards demands for the complete removal of all barriers to women’s participation and their emergence as elected representatives in Nigeria’s democratic process. The Chief Executive Officer of NWTF stated that the purpose of the meeting was to discuss the varying challenges faced by female candidates in the 2019 General Elections irrespective of their political parties. She commended all women who have put themselves up to be elected and described them as courageous women worthy of commendation. She described female candidates in the elections who have gone ahead to file petitions at the elections Tribunal as bold and expressed hopes that the judiciary will truly be their last hope. Furthermore, Ms. Fijabi decried the steady decline in the number of women in Nigeria’s democratic process stating that “Until women are recognized as significant players in nation building, and meaningfully represented in governance, the development of the country will not be as fast as it should be”. Also at the strategy meeting were three (3) female candidates. They were Rt Hon. Mulikat Akande Adeola who contested for the Oyo North Senatorial District under the People’s Democratic Party, Hon Phina Kanu who contested for the Abia State House of Assembly under All Progressive Congress and Mrs. Christina, who contested for the Imo State House of Assembly under Social Democratic Party. The women present at the event shared varied experiences which showed that female candidates in the elections encountered several challenges including intimidations, militarization of the electoral environment, electoral violence, voter inducement and voter suppression. The women collectively stated that due to the injustice suffered, they have resolved to challenge election results at the tribunals. “In the midst of all these challenges, we remain hopeful and motivated by the fact that increased political participation and representation of women will promote and accelerate economic growth in Nigeria while hoping that reclaiming our mandates will be promptly and justly addressed by relevant institutions” Rt. Hon. Mulikat Akande Adeola stated on behalf of the women present. Mrs. Phina Kanu lamented the level of intimidation and threats directed at her supporters in her constituency. While reechoing the acute problems faced by women who show interest in politics, she however urged women who want to contest to begin early enough in order to gather an effective support base. Similarly, Mrs. Christina Ude, narrated an experience of political tokenism against her aspirations. According to her, she was urged to step down her political aspirations for an appointive position in which she declined. In addition, Mrs. Ude also stated that her supporters were intimidated, and she also witnessed her supporters been prevented from voting for her nor any woman. She also decried the increasing rate at which voter inducement is growing. Also speaking during the event Mr. Austin Aigbe of Centre for Democracy and Development (CDD), Nigeria decried the poor level of representation of women in governance stating that, the importance of an inclusive democracy in Nigeria cannot be underestimated. He also called on all stakeholders to support women’s participation in governance by ensuring a safe electoral environment. The event was attended by members of Civil Society Organizations, women politicians the Media and other stakeholders.